Total War Heaven » Forums » Medieval 2: Total War Discussion » CONTEST: Win an INVITE to the Medieval 2 Gold Code Day in London November 8! 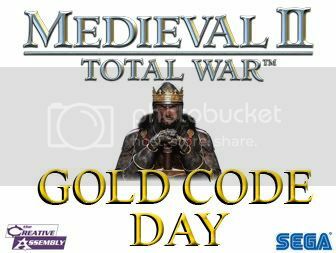 Topic Subject: CONTEST: Win an INVITE to the Medieval 2 Gold Code Day in London November 8! Please note that the date of the Gold Code Day has been postponed to November 8, and that the deadline has been extended to October 30! We at Rome: Total War Heaven are pleased to announce, as one of the largest and best Total War Communities, that one of you, the dedicated fans of CA and Total War, will obtain the privilege of playtesting Medieval 2 before your peers at the SEGA Europe HeadQuarters on November 3. Imagine, you'll be one of the very first people of the world to check out the gold code version! There's one catch, however. Remember that we have only one invite to give away, and obtaining it is no easy task. Simply put, show us that you deserve to go! How, you may ask? It is up to you to perform something of startling originality: tell us what you're going to do, how you're going to do it and when you're going to do it. And most importantly, DO IT and report the whole thing to us in this very thread - provide proof that it has been carried out in the form of a sequence of photographs. MOST IMPORTANTLY: Contestants must be aged 16 years or more as this is the age rating of Medieval 2 Total War. The winner must be able to get to Kew Bridge in London on the morning of the 8th of November. Entries are to be posted in this thread no later than October 30! - It must be legal, both in the UK and in your home country if different. - It must be realistic. No asking the Pope whether another Crusade to the Holy Land is in order... ok, nothing wrong in asking him, but good luck getting by the guards! - It must be decent. So, sorry, no marathon orgies or other naughtiness that might spring to mind, are going to win. - No cruelty to animals (or humans, for that matter) will be acceptable. - Doing stupidly life-endangering stuff won't help you win. If you injure yourself, that's your problem, because we warned you NOT to do dangerous stuff. - Remember that whatever you do is at your own risk. Hi guys how ya doing. Just a quick line on this do have to be sixteen or over I'm afraid as that is the age rating on the game. Damn You! Overprotective world... What has happened???????????? Well I'm glad I'm sixteen then. Join the Citadel: Total War mod. A modification for Rome: Total War. I love my bowler hat! ANYONE can rule the Empire with Medieval II Total War! So here it is. Turns out you can't just use any kind of rope, should have listened to RTW and used animal sinu (whatever that is). Basically it was a balista at first but the arms weren't powerefull enought. So I added some steel strips sort of in a leaf spring fashion like for springs on big trucks. Turns out you can't substitute just any old piece of steel for the real thing since when cranked down and fully loaded the steel started to bend. This was a dissapointment in short. I've since dismantleded it, it could only shoot a shovel handel to that pile of dirt not even 30 yards a way. When I made a trebuchet about 7 years ago (after watching discovery) with a counter weight of about 140 lbs, it could throw a 5 lbs rock (one about the sise of a persons head, but a bit smaller) a good 60 yards. Now that was going somewhere, but the arc was way to high, never quite got it down so it would go shalowere and further. Three good entries there, there's not a lot to choose between them. Remember, the deadline is tomorrow. No, Darth Xanther isn't entering. He lives in Canada. He's just posting those pictures for general interest... I must say that looks pretty good. Thumbs up! And how old are you ben_is_sparky? Please be under 16! Good entry though. That is one piece of impressive work, Darth! Ben's idea is quite witty... it should make a good advertisement for the game, if nothing! I vote Darth! Ballistas rule! If you don't mind, but i have a suggestion for you: You could show the physics behidn the ballista and accuracy during the roman times and its historical significance, because i think that takes it to the next level to prove how to got such a great product. Thanks Saranalos for letting me know how to post images. Thanks for the comments guys, my family thinks pc games are stupid, and they weren't impressed with my treb nor my balista/scorpion. So I'm glad that some of you like it. Actually je_suis_tahmid, I found an excillent site that has all you would want to know about trebs and balistas/scorpions physics. http://www.xs4all.nl/~mdgsoft/catapult/ballistics.html Check out the onager simulator at the bottom of the page (actually the picture and math behind it seem to be more towards a trebuchet. This site actually has the formulas in the form I recognize from my university physics clases. And November the 8th? I suppose I could go then if I do happen to win... Slightly more difficult though. If it gets extended any further I'd have to pull out of the competition. come on everyone - we need some more entries! Although I have to say I'm suprised at the lack of entrants. Anyhow, it's the 30th today. Got to say loving some of your work here! 7 hours 50 minutes left for everyone who wants to submit anything. Come on, I know you want that invite! OK, I'll give it a go as well. a) I am in a position to reach London in time without having to do some spectacular journey or spend a fortune, I can even go there by train. b) I have been a dedicated MTWI player and think that this game has affected my life in certain ways, amplifying already existant interests and creating new ones. c) These ways can be seen on my Homepage - and once you have seen it, you will without the shadow of a doubt know which faction I favour above every other. This will serve as my contribution to this contest. See for yourselves... German only, I'm afraid. I rest my case... now choose justly and wisely. So, has the competition been judged yet? And unfortunately for Xanther he can't enter, being in Canada. Otherwise he'd probably win with his ballista/scorpion. They got that bit wrong. Yeah, when do we find out the result? Soon, I expect. I could say who it is likely to be, but that would spoil the surprise. I'll just have to wait till the game comes out and play it that way. I CAN'T WAIT. Usually i'm very patient, I have no problem waiting for movies to come out on DVD to buy them, and somethimes I'll wait till the expansion of some games comes out and buy the bundle. But this one seems different for some reason. Best of luck to you guys who entered in the competition. I'm expecting a detailed description by the winner of how the game is and how much you loved it by monday morning in this forum . What if they have to sign one of those damn non-disclosure agreements?